The idea of strength has changed for me over the years (see Part 1- Inner stillness is the key to outer strength). Power can come in the form of compassion, patience, and even holding back. There is also power in acknowledging that you have much to learn and do not have all of the answers. 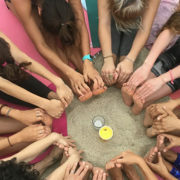 This past June I attended a yoga teacher training down in Sayulita, Mexico. It was amazing the amount of people who said – “Don’t you already teach yoga?” Yes, yes I do. I have taken workshops and trainings in various styles including Anusara, Baptiste, Rocket, and Jivamukti yoga and although I have practiced yoga for 14 years now, I was not drawn to teach until just a few years ago. I find the question so interesting because many assume that you are done learning after becoming “certified” for yoga, or fitness training for that matter. Where as I believe that the “certification” is only the beginning. The greatest teachers I know are the one’s who are also great students. There is a vulnerability in both roles and when you allow yourself to be vulnerable you also allow opportunities to grow and gain strength. I am currently teaching at Rancho la Puerta down in Tecate, Mexico, one of the oldest fitness and wellness spas – founded in 1940! They recently won “best fitness program” by Travel and Leisure. I am honored to be spending my summer teaching and training here but what is most exciting for me it that I am able to take classes from these world class instructors and presenters. Pinch me. I literally learn new teaching methodologies or cutting edge wellness and mindset practices every single day! Another huge bonus to taking classes or attending trainings is the knowledge I gain from fellow students. Our minds work in different (but equally cool) ways and you can learn a lot from how other people process information and problem-solve. To be honest, some of my ‘best’ lessons have come from what I see in myself while in a group setting. You can read all the books, or attend 100’s of classes but it is what you apply that makes the difference. Hmmm.. kind of sounds a lot like taking action. :) Be courageous enough to take action – even if you think you can’t, and especially if it is not perfect. True wisdom comes from your experience while traveling the road of life. Be a lifelong learner. Be vulnerable. Be strong.